"The hybrid that started it all." Our proven Hybrid Synergy Drive® system combines the benefits of an efficient gasoline engine and a clean, quiet electric motor. It can be powered by the engine, the electric motor or a combination of both, and will automatically choose the most efficient mode for the best mpg. In addition to normal operating mode Prius offers three driver-selectable modes: EV, ECO and POWER. EV Mode allows Prius to run on battery power alone for up to one mile; ECO helps improve fuel economy by adjusting throttle input and climate control; and POWER helps create a more spirited driving experience. Coefficient of Drag (Cd) is a measurement of how effectively a vehicle’s shape slices through the air. The lower its drag coefficient, the more aerodynamic it is, which means it requires less energy to push it through the air. 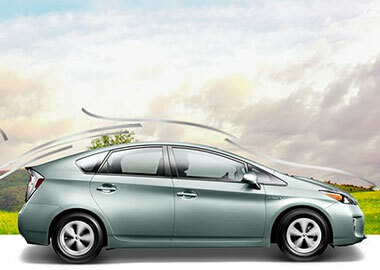 With a Cd of only 0.25, Prius is one of the most aerodynamic production cars in the world. Daytime Running Lights (DRL), which switch on whenever the engine does, help prevent daytime head-on collisions by making you more visible. 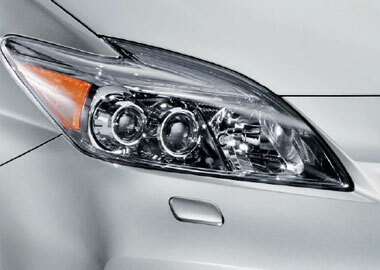 Prius Five comes standard with LED (light-emitting diode) headlights, which use 20% to 30% less energy than traditional headlights and have auto level control, auto on/off and headlight cleaners. 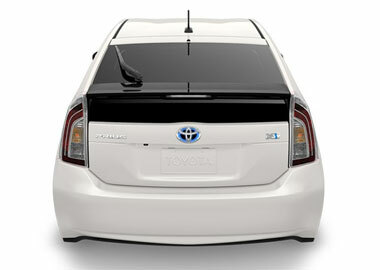 The liftback design of Prius opens wide to meet your cargo needs. Whether it’s a grocery run or a trip to the home improvement center, Prius has a surprising amount of room to handle the necessities of life. It’s like leather, but better. Our available SofTex® trim material weighs about half as much as the real thing, and its manufacturing process generates around 85% fewer CO2 emissions and Volatile Organic Compounds (VOCs) than that of conventional synthetic leather. As sleek and aerodynamic as Prius is, you might not expect a lot of interior room. But when you open the doors, you’ll be greeted by an open and airy 5-passenger cabin with 42.5 inches of leg room up front and 36 inches in the rear. If you want to stay cool, park in the sun. The available Solar Roof is embedded with solar panels that can power a fan to circulate ambient air through the cabin when Prius is parked in direct sunlight. This feature helps keep cabin air temperature close to that of the outside air for a more comfortable return to the vehicle. When you’re backing up, the backup camera displays the area behind the vehicle that’s visible to the camera on the touch-screen of the navigation system or on the audio system’s display. Sometimes it takes forward-thinking features to help you see what might be behind you. Prius helps keep you connected to your network and entertainment. Bluetooth®, connectivity lets you make hands-free phone calls without even having to touch your phone, and wirelessly stream music from your phone or compatible MP3 player to the audio system. Prius also comes standard with a USB port so you can plug in a thumb drive with your favorite MP3 files, or connect your compatible iPod®, and control it through the audio system. Another Prius innovation, Touch Tracer Display places an image of your steering wheel controls on the Multi-Information Display. Whenever you touch one of the controls, that feature will illuminate, so you’ll know what you’ve got your thumb on without having to look down at the steering wheel. It’s not only cool and very convenient, it helps you keep your eyes on the road..
Prius provides you and your passengers with a total of seven airbags, including driver and front passenger Advanced Airbag System, driver and front passenger seat-mounted side airbags, a driver knee airbag and front and rear side curtain airbags. Working in concert with the Dynamic Radar Cruise Control (DRCC), the available Pre-Collision System (PCS) employs the vehicle’s radar system to determine if a frontal collision is imminent. If so, the system automatically applies the brakes and retracts the front seatbelts to prepare for such a scenario. If an inadvertent lane departure is detected, the available Lane Keep Assist (LKA) issues an audible warning and displays a warning on the instrument panel. And when Dynamic Radar Cruise Control (DRCC) is engaged, LKA is designed to help keep Prius in its lane by providing gentle corrective steering when necessary. When Prius is traveling below 15 mph and running on electric power only, it’s often too quiet for people to hear. So VPNS emits an undulating mechanical sound to alert pedestrians and bicyclists of your presence.